Crocus blooms don't make very good cut flowers. However, if you dig carefully (keeping the bulb and most of the root structure in tact), you can "borrow" a few crocus bulbs from your garden to enjoy indoors for a week. I dug these crocus on Monday. They are now bringing cheer to the kitchen eating area. In my rainy climate, most of early spring can pass by with nary a clear day to get outside to enjoy garden blooms. Bringing some of the blooms indoors ensures that I will indeed get that chance to marvel at their beauty. I dig a couple of crocus, grape hyacinths, and primroses, then place in pots of soil for indoor loveliness in the weeks leading up to Easter. I keep them watered like any other houseplant. When the blooms have faded, I return the plants to the garden, adding a bit of bulb food to the hole in the soil as I replant. I water them in good, then rely on our abundant rainfall in March and April to take care of the rest. I also brought some cherry tree branches into the house. I pruned the fruit trees this afternoon and thought how lovely some stalks of cherry blossoms will be in a few days. So, I brought some of the thinner branches indoors for vases. How lovely to have spring flowers inside. Of course, I enjoy them all outside because of my cats. But I do remember when I was living in the dorm in college someone got me a crocus pot with holes all over the sides and a crocus grew out of each one. It was beautiful and exactly what was needed in the long cold winter months. your cats must be an unending source of entertainment! Your crocus pot from years ago sounds like just the kind of winter pick-me-up a college student could use. What a sweet friend! Lovely! I can't wait for spring blossoms! So far, our March has been on the cool side of normal. While walking around the yard Saturday, I noticed I have Easter lillies and tulips up, but no flowers yet. I can't wait for my apple and pear trees to blossom either. It hasn't been a particularly nasty winter here in Ohio, but still seems long. it seemed like winter was hanging around far too long, here, for my area, too. That is until this week, then suddenly we jumped into summer for 2 days (70 degrees). February and early March were very cool for us. I expect that we will have a burst of spring flowers all at once. You may, too! So very pretty! My cats would think it was a personal toy and there would be a dirty mess of destruction all over my house! I'll wait for the outdoors to "pop" with new life and color. Waiting for the flowers outdoors may be best, then! Cats are so funny and mischievous! Oh, what a good idea! I am part of the "cat club" so I am very careful what plants I bring into my home--but I can see them from my dining area window without having to go outdoors, so, bonus! 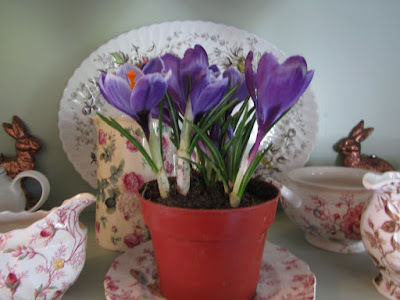 Even your picture of your crocus made me smile. okay, so that's great that you can see them easily from indoors. 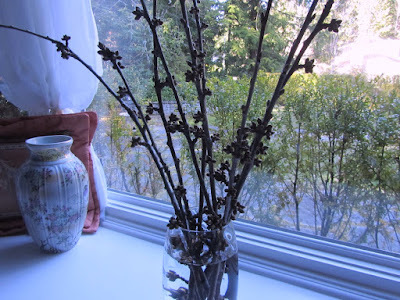 I haven't gotten to it yet, but I usually drag a few pots of spring flowers to a table just outside the bedroom window. When it's rainy, it's nice to be able to see the beauty from the warmth of indoors. In the vintage area near us, there is a store that always has grape hyacinth and crocus in pots integrated in their displays in spring. It is so cheery to see. It's been ncie having the crocus in the kitchen this week. When I return them to the ground I'll pot up some grape hyacinth. I hope that you're having a nice spring!